Peach, pineapple, and papaya – three fruits in a synergistic combination that’s very appealing to the taste buds. This smoothie is amazingly delicious and reminds me of the fruit flavored slurpees I use to get from 7-Eleven years ago. Thankfully my fondness for slurpees has been replaced by healthy smoothies. 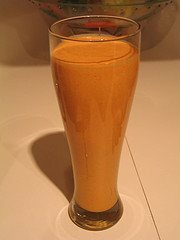 If you have a sweet tooth like I do, satisfy it with something healthy like this smoothie. Let’s touch on few of the health benefits the three P’s have to offer. Peaches are high in a number of nutrients including beta carotene, niacin, thiamine (vitamin B1), potassium, and calcium. Pineapples provide plenty of antioxidant protection and immune support from high amounts of vitamin C, manganese, and thiamin. Papayas are also rich vitamin C, the B vitamins, folic acid, potassium, and magnesium. Together these fruits provide an array of vital nutrients and plenty of dietary fiber and enzymes for optimal digestion. This recipe calls for 1/2 cup of each fruit, but feel free to vary these amounts depending on availability and preference. Enjoy! Place all of the ingredients into your blender and blend for about 30 seconds or until desired consistency is reached. I would love to know if you try this triple P smoothie – please leave a comment below. Happy Blending! I first tried this because I had the stomach flu. No solid foods could cross my lips. This could though. Delicious and refreshing. I suspect I will continue to make these once I’m feeling better. I used canned peaches, fresh pineapple, fresh but then frozen papaya. Unsweetened unflavored almond milk.